Do you ever have those moments where it feels like everything is happening at once? Life seems to be so busy that you don’t get a chance to stop. It’s like one chapter after another, and you don’t stop to put the book down. That’s what I’ve felt like lately, minus the three week break after my last job, but even then there were appointments and catching up on life. Last week I started a new job, a major career change, which in itself was a big deal. But then that change gets paused by jury duty this week, which was draining to say the least. I’m looking forward to next week, I feel as if things are due to go back to normal, and I can enjoy having more spare time. A couple of weeks ago when the Perth weather changed to winter I had a craving for pasta, meaty pasta, rich with flavour and warmness. 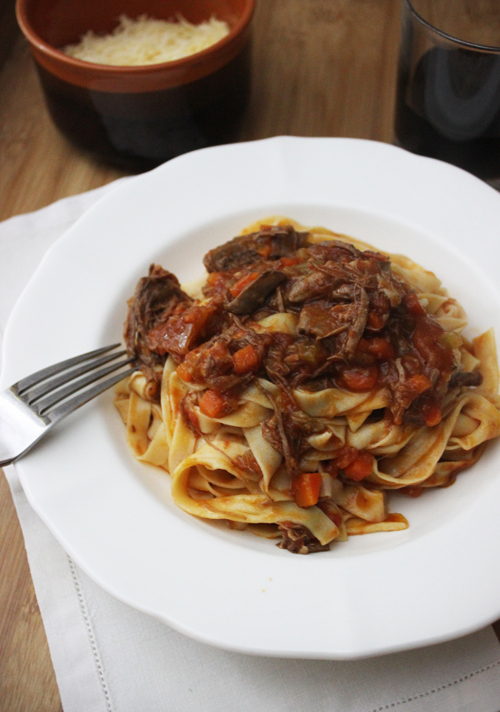 I went to shops and found some cuts of meat that I knew would work well in a pasta sauce. I think that’s the key point of this pasta dish – use what you can find. Chicken legs, pork ribs and lamb shanks work amazing in this dish. You can mix and match, do as you feel! Cooking this for 2 – 3 hours you end up with tender meat that shreds beautifully. I made this pasta to go with it. 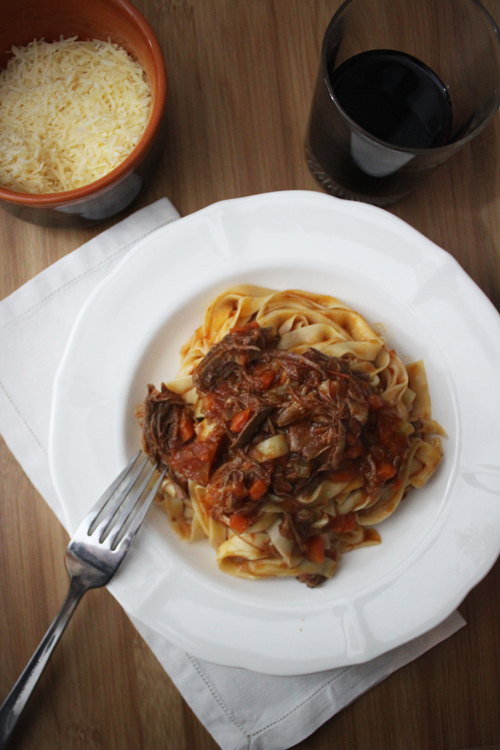 Fresh pasta and a rich and meaty sauce – nothing better! In a large heavy based pot over a medium heat, add a good slug of olive oil. Add the onion, carrot and celery and sauté for 10 minutes until they have softened and the onion is slightly transparent. Add the garlic and stir well. Add the meat, turning so they brown a little, then add the tin of tomatoes and passata. Pour in the wine and water (I like to mix the water in the tin and passata bottle to get all the goodness) and add to the pot. Add a couple of pinches of sea salt, stir, and then place the lid on top, reduce the temperature to low and let it cook for 2 – 3 hours. The sauce will have reduce and become thick when ready. When the sauce has cooled slightly, remove the steak and ribs. Discard the bones and shred the meat. Place the meat back into the pot and stir. Wow, I can't help drooling. I just love this.. 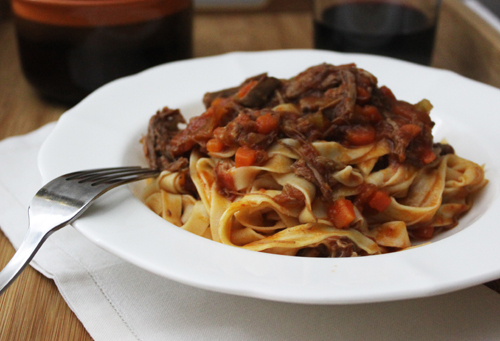 If you submitted your slow cooked beef and lamb ragu photos to http://www.foodporn.net , I'll bet they will make you on the home page.